LONDON (AP) — Arsenal broke through Stoke resistance with three goals in the last 15 minutes to win 3-0 in the Premier League on Sunday. Pierre-Emerick Aubameyang opened the scoring from a penalty after Bruno Martins Indi was adjudged to have fouled Mesut Ozil, only for replays to show he won the ball. 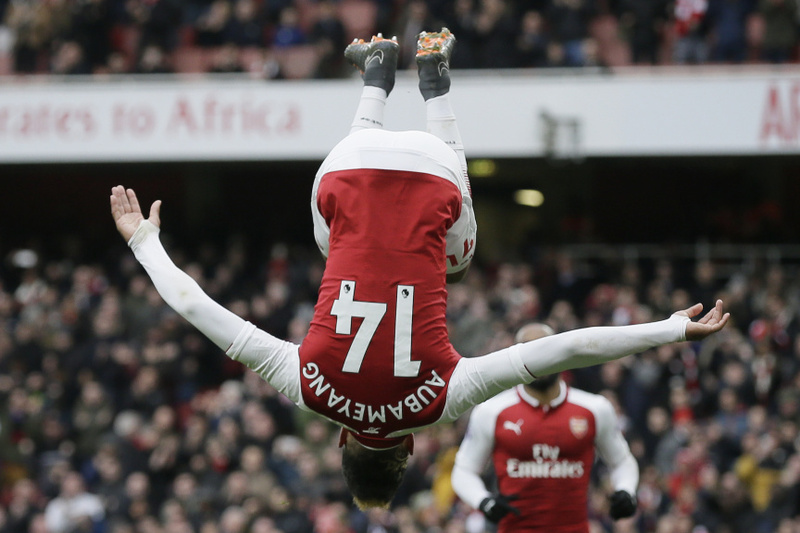 Aubameyang added a second before substitute Alexandre Lacazette marked his return from knee surgery with another spot kick. For sixth-place Arsenal, the priority is wining the Europa League to secure a route back into the Champions League. The north London club hosts CSKA Moscow in the first leg of their Europa League quarterfinal on Thursday. Stoke, which remains next-from-last in the standings, had worked hard and looked to be on for at least a valuable point, until a late capitulation. The defeat leaves the visitors three points from safety with six games remaining. Stoke had the better of the early exchanges, with Xherdan Shaqiri curling a decent effort wide of David Ospina's post, the Colombian retaining his place in the Arsenal goal as Petr Cech missed out with a groin injury. Arsenal took some time to get going and did not threaten the Stoke goal until the midway point of the first half. Hector Bellerin's low cross was deflected up into the air, with Jack Butland only able to send the ball in the direction of Aaron Ramsey, whose looped effort bounced off the top of the crossbar and behind. It was Ramsey who again came close after some smart work from captain Jack Wilshere allowed him to get a shot away that was deflected off target for a corner. Mohamed Elneny saw a driven effort blocked by Martins Indi early in the second half, with Nacho Monreal's measured shot from the rebound saved by Butland. Wenger turned to fit-again Lacazette in the hope of adding to the team's attack, while Stoke introduced Saido Berahino in place of the injured Mame Biram Diouf. The visitors briefly broke forward with a quarter of the game remaining, Shaqiri only able to angle a shot straight at Ospina following a corner. The Switzerland international almost scored directly from the next corner, hitting the inside of the post with a whipped setpiece that had Ospina beaten. Berahino, too, had a decent chance as Stoke looked to spring a surprise, the result of which was a response from the hosts. Aubameyang, on the periphery for much of the contest, broke the offside trap but was denied by Butland, before Lacazette's close-range strike was blocked behind. Calum Chambers bundled the resulting set-piece into the welcoming grasp of the England goalkeeper. The turning point came with 15 minutes to go as referee Craig Pawson pointed to the spot after Ozil went down under close attention from Martins Indi. The Stoke defender had a right to feel aggrieved as he got his foot to the ball but Aubameyang stepped up to convert the resulting penalty. Badou Ndiaye curled an effort wide as Stoke chased a leveler before Butland did well to prevent substitute Henrikh Mkhitaryan and Ozil doubling Arsenal's lead. But Butland could do nothing to stop Aubameyang turning home his second of the afternoon, before Lacazette converted from the spot after he had been shoved over by Ndiaye.